Welcome to the first day of August! We will announce out July challenge winner today. We loved seeing all your colorful rainbow creations! 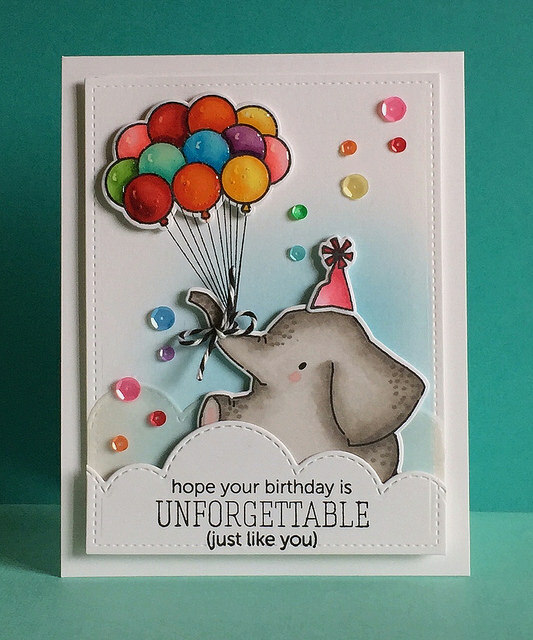 This month's top pick is >> THIS << perfectly executed card by Kim Hamilton! I mean, look at that! She's got the pretty ink blended blue sky. The perfectly colored Ella with her gorgeous spots for depth and character. We love all the beautifully coordinated layered she created using the cloud border from Landscape Trio. And the cluster of balloons from Up and Away is always fun! We never get tired of seeing that! Bravo, Kim, bravo!!! Congrats, please email us at mamaelephant.winner@gmail.com with your selection of TWO Mama Elephant stamps of your choice! Wow >> THIS << card from Kate is just jaw dropping! I wonder how long it took to glue each sequin down? Beautiful! I thought >> THIS << card from Ren L using Fair Feather is just the coolest thing ever. WOW. And look at >> THIS << pretty set of cards by Stamping Smiles Design. The colorful rainbow background really enhances the beautiful sentiment!!! Thank you so much to ALL of you for playing along and sharing your talents with us! The new challenge for the month of August is to break out your watercoloring skills once again! 6. We'll be picking one winner who will win 2 stamp sets of their choice! Woot! Thanks so much! You have made my day! I love the Flickr challenge. So many inspirations! Thanks for the honorable mention! Makes me happy that you girls like my set of cards! Congrats to the other winners too! What a bright and fun card!! Love all the colors on the card! Nice job. I'll have to see if I have any Mama Elephant stamps for the challenge because I would love to enter!